A buzz was in the air at BHS as we prepare for our boys' hockey team's trip into TD BankNorth in Boston on Sunday to take on Milton in the Division 1 State Championship. We hope to have a great showing of students, parents, Burlington residents, and anyone else who wants to jump on the Red Devils Bandwagon. 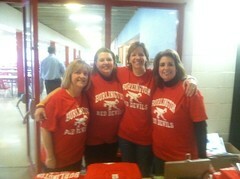 If you would like to join our fans in the "sea of red" feel free to stop by the high school between 10-12 on Saturday and get your red Burlington Red Devils Hockey shirt (modeled by some of our hockey moms on the left. The back of the shirt says "Div. 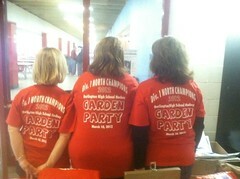 1 North Champions 2012 Burlington High School Hockey Garden Party March 18, 2012." The cost of the shirts is $10.00. The video on the bottom is from our win over Wakefield on Monday night. Thanks to Lifetouch for providing the great photos. Fans can download and order any of the photos from our Flickr account.